What If Eve Ate the Forbidden Fruit and Adam Had Not? Have you ever thought about the question, what would have happened to the mankind if Eve had eaten from the tree of the knowledge of good and evil and then as she gave to Adam the same forbidden fruit, at that point of time what if he had shunned away from it and informed God about the disobedience of Eve? Very strange to think such a scenario, right. But this scenario was as much a possibility as the present scenario of fallen Adam and Eve. God never intended for Adam and Eve to fall in the Garden of Eden. Only the Hindu ‘Karma’ Theories say if something bad happens in one’s life it is because of fate and the destiny that God has already set for that person. In other words all these theories speak about ‘the doctrine of inevitable consequence’. In Hinduism and Buddhism 'Karma' is the principle of retributive justice determining a person's state of life and the state of his reincarnations as the effect of his past deeds. In other words, man is a product of the past life that he lived before his birth. What a fatalistic destiny? It is not in the hands of the human beings to set their own life in the right path of goodness and godliness. These Buddhist and Hindu philosophies also have a strong belief in the reincarnation of souls in the next life based on what we do in the present life. My question is, ‘If a person doesn’t have control over his present life because of His irreparable past, how can he by doing something good in this present life can alter the destiny of His future life?’ This is the folly of such theories that have no basis of logic. It is like giving a man a cycle without a wheel and saying to him ‘do something and go toward this destination by riding on the cycle I have given you and you will reach this destination.’ According to me that man would have better walked without such cycle to his destination if it had not been given to him. These theories say that God Himself cannot do anything to change these cycles of rebirth of humans in to lesser level beings such as animals, birds and all such creatures, for the good and bad things that they do in the present life. These theories take the God who rules the world and make him in to puppet of their own imagination. In fact nearly all of man’s theory about God justice is that a man should carry the sins of his father and of his father’s father who have done bad things and also each should bear the guilt of their own folly even if the convict wants to change (John 9:1-3; Job 22:5). Even God allows mans philosophy if he wants to live without Him (Exod 20:3-6). The God of the universe is a gentle man who never overrules the will of man. He allows man to choose his own folly if he keeps on insisting to go his own way (Prov 1:29-32). At the same time, the God of the Bible is very concerned for the eternally immortal soul of each person which is created in His own image (Gen 1:26). This is the reason God spoke through Ezekiel His prophet saying, “19 “Yet you say, ‘Why should the son not bear the guilt of the father?’ Because the son has done what is lawful and right, and has kept all My statutes and observed them, he shall surely live. 20 The soul who sins shall die. The son shall not bear the guilt of the father, nor the father bear the guilt of the son. The righteousness of the righteous shall be upon himself, and the wickedness of the wicked shall be upon himself. 21 “But if a wicked man turns from all his sins which he has committed, keeps all My statutes, and does what is lawful and right, he shall surely live; he shall not die. 22 None of the transgressions which he has committed shall be remembered against him; because of the righteousness which he has done, he shall live. 23 Do I have any pleasure at all that the wicked should die?” says the Lord GOD, “and not that he should turn from his ways and live? “ (Ezek 18:19-23). In the preceding verses God Himself wants people to be acquitted of their father’s and forefather’s sins and want each person to be only accountable for their own bad choices. Even those wicked things that people do he is always ready to forgive, if that offender is ready to change His pattern of thinking by keeping all of God’s commandments and do rightly from then on. 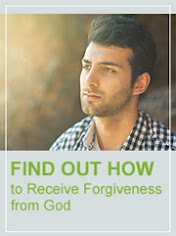 Never forget that God not only desires to forgive your wickedness but also he assures you that once He forgives you of all the bad things you have done, He forgets it completely and willingly by throwing all those bad things away for eternity as though you have never done it at all (Ps 103:12; Col 2:13-14). O what a merciful God!!! If God marks the sins of a human one by one and brings to justice immediately in his earthly life, no man can stand before God even for a moment (Ps 130:3). God forgives the sins of man that He may be feared in reverence and awe (Ps 130:4). God desires all men around the world to change their wicked lifestyle and live under the blessings of God. God Himself expresses that he does not want a single offender to die in their wickedness and expects all to turn from their own ways of self-justifying, wicked and sinful life, and want them to exhibit His God-life on earth. This is the exact attitude of God. It should not be misrepresented by any human agency. This is the exact reason David who was the man who understood God’s heart of mercy wrote in Psalm 103:8-11, “8 The LORD is merciful and gracious, slow to anger, and abounding in mercy. 9 He will not always strive with us, nor will He keep His anger forever. 10 He has not dealt with us according to our sins, nor punished us according to our iniquities. 11 For as the heavens are high above the earth, so great is His mercy toward those who fear Him”. The Bottom line is, turn towards God and live because of God’s mercy to forgive the sins of any human no matter how vile it is. Each man who really knows God’s unending mercy will enjoy it as David the man after God’s own heart enjoyed it, and out of gratitude for God he will write poems, songs and sing to God even as King David wrote songs and sang about God’s unending mercies in his life (Acts 13:22; Ps 59:16). All these things point to the wonderful Characteristic of the God of the Bible who does not give a doomed fate to happen in one's life as a cold hearted brute toward people’s life and destiny existence, but who responds to every man’s heart cry towards freedom from sin and power to change from their wicked ways. When a man comes to God saying I am hopelessly sick with sinfulness, please save me, that is when God says you are forgiven because of my mercies. The Lord saves and then declares the same man to be a righteous man before Him (Rom 4:5; 2 Cor 5:21). Then he gives the righteous man the power to overcome sin, sickness and even death (Rom 6:14; Deut 7:15; Ps 68:20). Praise the Lord! What would have happened, if he had not? Apostle Paul have clearly said, “…through one man [Adam] sin entered the world, and death through sin, and thus death spread to all men, because all sinned” (Rom 5:12). In other words until Adam took the forbidden fruit in his own hand and ate it out of His voluntary will, sin which is lawless of Satan and his demonic cohorts were not able to enter the world system of governance and have dominion over mankind (1 John 3:4, b). The Apostle Paul agrees with this preceding statement in another place by saying, “11 Let a woman learn in silence with all submission. 12 And I do not permit a woman to teach or to have authority over a man, but to be in silence. 13 For Adam was formed first, then Eve. 14 And Adam was not deceived, but the woman being deceived, fell into transgression. 15 Nevertheless she will be saved in childbearing if they continue in faith, love, and holiness, with self-control.” (1 Tim 2:11-15). This verse in 1 Tim 2:11-15 have been used wrongly by many people for the past 2000 years to deny women of God to teach or preach in many denominational churches, but the real meaning of these verses were not taken in context and interpreted. These verses in 1 Tim 2:11-15 points that a family is the fabric of all society. This is the foundation and a building block to all great achievements with God and the source of all spiritual blessings of God which has been lost by Adam. God has set authority gateways on earth to release his power all over the earth. The first mandate that God gave to man was not to evangelize the world but to be “…Be fruitful and multiply; fill the earth and subdue it; have dominion over the fish of the sea, over the birds of the air, and over every living thing that moves on the earth." (Gen 1:28). Just as water can flow in to the cities and towns only through the gateways of the lakes which have been built, so also God’s dominion on earth works through the gateways set by God. The Hierarchical structure of gateway that God has placed is, Adam connecting to God and receiving the power of dominion and then sharing it with Eve, so that together they can fulfill the Creation-mandate and cover the earth with the authority of God. The enemy was not able to infiltrate the first appointed gateway of God because Adam have been directly taught by God and imparted with the knowledge of God of what will be the consequence of disobedience is, which is death (Rom 6:23). 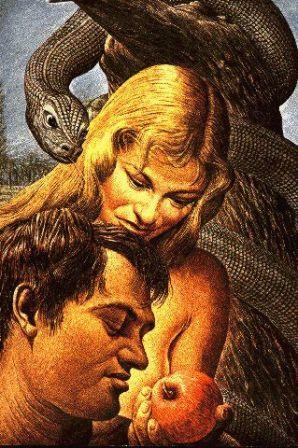 Because Adam did not teach her wife the same way God had taught him, Eve became an easy target of Satan’s lies of deception due to lack of knowledge (Hosea 4:6). The same is true till today, God expects a husband to share the authority and dominion that he receives from God and thus allow the whole family to prosper. In the spiritual family of God these same formulas are applied but with a difference. Once the men whom God has chosen to be apostles, prophets and the other five fold ministries get equipped with the doctrines of God’s word and authority through connecting with God (Eph 4:11-12, 13-14; 1 Tim 3:12, 2; Titus 1:6), they must be able to impart it to all the husband leaders of the household who should practice the word in their daily life and again share the authority they receive from God individually with their wife to build their homes prosperously. This does not mean that God cannot choose a women and use in the five-fold ministries, the male choice is not God's rule but a principle. We see right throughout both New Testament and Old Testament God using women at certain places by His sovereign will, by placing leadership gifts within them. 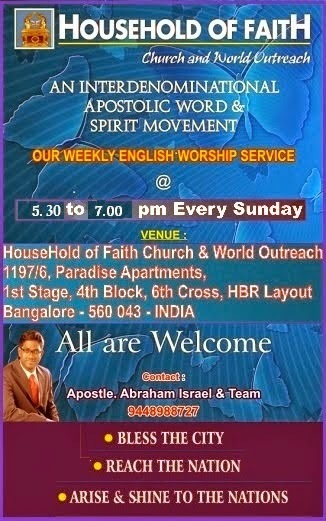 Also the very basic promise of pentecostal outpouring to prophecy is promised both for mensevants and maidservants of God (Acts 2:18; 1 Cor 14:3-4). When the first Adam failed in his duty, Satan took advantage of it and tempted Eve first and thus reached Adam to completely steal the authority of Adam by taking control of his soul. Even after Eve had eaten the forbidden fruit, if only Adam could have refused to eat it, and thus also if he had taken this case to God, Adam would have still held the dominion over the entire earth in his life. Death could not have come in to the life blood of humanity. Sin could not have held humanity in its grip. Even though it would have affected all women, Adam by His authority of God would have been able to rebuke Satan and make him flee. Adam would have had the authority and dominion of God to restore the curse whenever Eve would live in submission to him. Alas, because of his dumb disobedience to God’s Holy Word, he ate and lost the entire progeny of his to sin and its cursed consequences. What was lost by the first Adam to Satan in the spiritual realm has been restored to humankind by the Last Adam who is Jesus Christ our Savior (1 Cor 15:45-46, 49, 21-22; Rom 5:21). This is the reason Apostle Paul was so confident about the power of Christ to restore women out of the pain of childbirth which is a curse that came to womanhood in the Garden of Eden, if only they continue under the spiritual authority of God that comes through their husbands at home (1 Tim 2:15; Gen 3:16). Adam and all the men folks would have never got in to depression, toiling for survival, search for meaning and purpose, insecurity which breeds distrust over one’s wife and makes him rule her in authority and not in love (Gen 3:17-19)...etc, if Adam would have wisely avoided to eat the forbidden fruit in the Garden of Eden. God always has the last laugh in everything because all things are made by Him, for Him and through Him (Col 3:16). Jesus Christ works all the good and even the bad things to work together for the benefits of all us who are called by Him in to salvation and for those who love Him (Rom 8:28). God was not actually surprised to see Adam fall in to sin because He always had a beautiful plan of redemption planned even before the foundations of the world (1 Peter 1:20; Heb 4:3). Once Adam fell in to transgression and the curse of sin began to choke humankind bit by bit, the lamb who was slain from the foundation of the world began to manifest His undeserved love, mercy and grace towards humans in His benevolence (Rev 13:8). God was not surprised by Adam’s sin and also He is not surprised by your sin too (Acts 15:18). It is God’s longsuffering towards us who are sinners by birth that finally makes us understand that the Lord is our salvation (2 Peter 3:15). The forbidden fruit has caused much suffering to us when our forefather Adam chose wrongly to eat it and break God’s friendship forever in a simple test of obedience and trust. But the same test has brought us underserved mercy, grace and love of God to manifest to all of us without measure freely, which would not have been given to us if we had not fallen in to it. Truly the heavenly wisdom of our Sovereign Lord’s is greater than the wisdom of the demonic ruler Satan and his minions of the present world system of governance (1 Cor 2:8). God has made a mockery of Satan and his followers by sending His only Begotten Son and agreed to restore frienship with mankind through His one act of perfect obedience unto death as their substitute (Is 53:4-6). Jesus Christ redeemed the whole mankind and lifted them up to a status equal and at par with His heavenly dominion and authority in the heavenly realm of man's spiritual existence which always affects the physical (Rom 5:19; Phil 2:8, 9-11; Eph 1:3, 19-21; 2:6). The great thing and the good news of all time is, what the first Adam our forefather failed to do, the last Adam Jesus Christ the only begotten Son of God came from heaven to earth and fulfilled all the perfect requirements of God to make all the people who believe Him to become the righteousness of God forever (2 Cor 5:21). Having become the righteousness of God in Christ Jesus let us learn to reign spiritually through what has already been achieved for us on earth (Rom 5:17, 21). The fall of Adam has brought sin and chaos in to the world, but at the same time it is a blessing in disguise which has allowed God to make His mercy, grace and love to be freely available to all of us, freely without any work on our part to earn it (Rom 3:22-24; Eph 1:3; 2:8-10; Titus 3:4-7). In fact, we who had no right to ask for anything from God because of our rebellious sin nature within us, suddenly had become God’s favorite friends through our faith in Jesus Christ (John 15:15-16). The next time you feel that an impasse has hit you hard in life, tell yourself that these things are going to work together for my good because I love God and He is indeed my friend who is working on behalf of me all the time. Praise the Lord!! !